On April 16, 1821, midshipman Robert Hood made the last entry in his journal. A 24-year-old British Royal Navy petty officer under the command of Captain John Franklin, Hood participated in an expedition to chart the Coppermine River as part of the search for the Northwest Passage. Hood’s final journal entry ended his descriptions of the daily activities as the group of British sailors, Canadian voyageurs, Aboriginal guides and interpreters trekked from York Factory to Cumberland House and then on to Fort Enterprise and the Coppermine River. Although the journal entries discontinued, Hood continued to note weather conditions and navigational data in other expedition volumes, and to produce at least one more visual record. 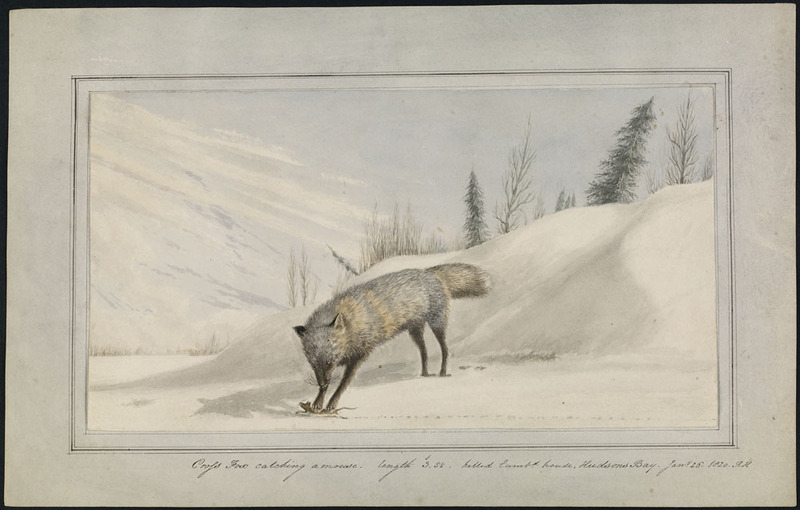 Library and Archives Canada (LAC) is pleased to announce the recent purchase of four watercolours from a Hood family descendant. 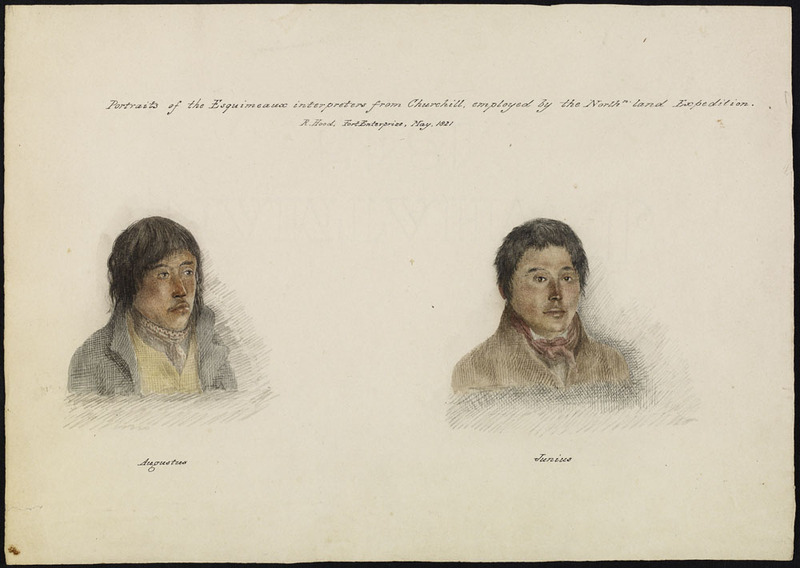 Portraits of the Esquimeaux Interpreters from Churchill Employed by the North Land Expedition is likely the final surviving work of Robert Hood. Completed in May 1821, the watercolour depicts Tattannoeuck (Augustus) and Hoeootoerock (Junius). Three other watercolours were acquired that were painted during the previous year while the expedition wintered at Cumberland House. 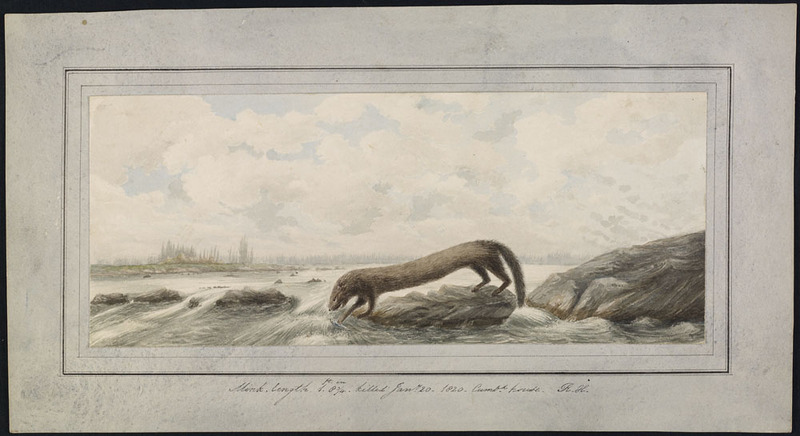 In January 1820, he drew a mink as it dipped a paw into the water along a rocky shore and a cross fox just as it caught a mouse in the snow. Two months later, Hood set out on a trek to the Pasquia Hills where he encountered a group of Cree. Invited into their tent, he recorded with extraordinary detail this watercolour, The Interior of a Southern Indian Tent [original title]. 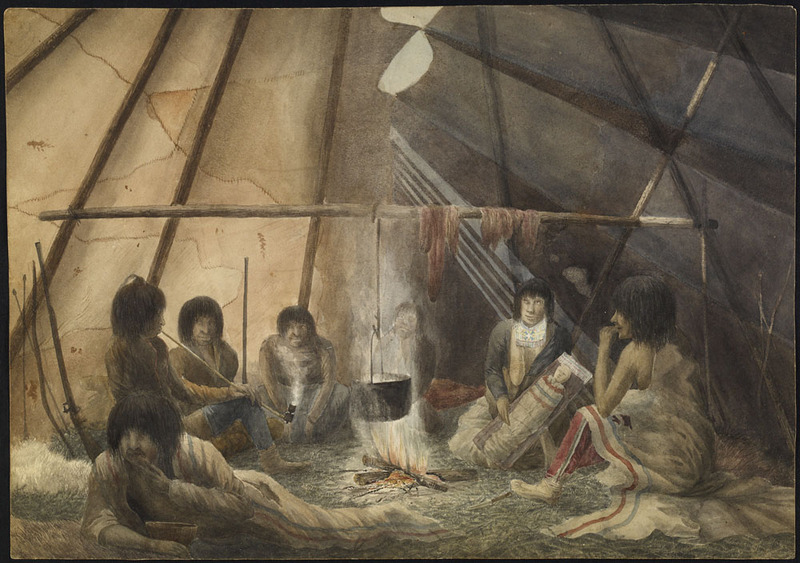 This image would be the basis of the print, Interior of a Cree Tent, which appeared in Captain John Franklin’s account, Narrative of a Journey to the Shores of the Polar Sea in the Years 1819, 20, 21 and 22. Unfortunately Robert Hood would not live to see his paintings published in Franklin’s account. Plagued by horrendous weather and insufficient supplies, the expedition resorted to eating lichens to survive. By early October 1821, it was clear that Robert Hood had become too weak from hunger to continue the journey. He was left behind with two British participants, while the others set off for Fort Enterprise in search of food and supplies. One of the voyageurs, Michel Terohaute, changed his mind and left Franklin’s group, returning to the Hood camp. On October 23, 1821, while the two other men were out searching for food, Terohaute shot and killed Robert Hood. Captain John Franklin managed to retrieve Hood’s journal and watercolours, which were given to Hood’s sister and distributed among her grandchildren. LAC was fortunate to acquire these four previously unknown watercolours which document a key expedition in Canada’s Arctic history. This entry was posted in Art, What's New at LAC? and tagged Franklin expedition, John Franklin, Robert Hood by Library and Archives Canada Blog. Bookmark the permalink. Thank you, thank you, thank you, LAC, for saving these important documents of native heritage and that of Canada!